Can you imagine Arethra Franklin fronting MC5? 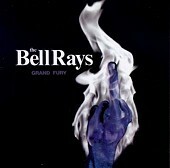 If you heard The Bell Rays, especially their latest, Grand Fury, the unimaginable is quite possible. The Bell Rays rip out spectacular punk explosive-ness drenched with soul. Running the gamut from hard rockin' metal to screaming punk, The Bell Rays always keep it loud and violent, but manage to make sure the songs are upbeat and lively, ensuring complete dance satisfaction. With enough soul running through their bones and blood, the jack hammer aggressiveness of The Bell Rays establishes them as one of the most unique bands of the new millennium. So many bands are recycling the sounds of yesteryear or recreating what is popular. Then there is music visionaries like The Bell Rays, a band that sought a different sound, had the talent to do so, and did. The result is one of the most ground breaking albums of late, completely traveling its own path, rocking between Arethra Franklin and Otis Redding to AC/DC and MC5.